In the Northwest corner of KS, is St Francis. It is on the east / west HWY 36. 36 is pretty legit for a two lane road through rural America. Basically, it stretches from Indianapolis to Denver. The North / South HWY is 27 - much less of a road. 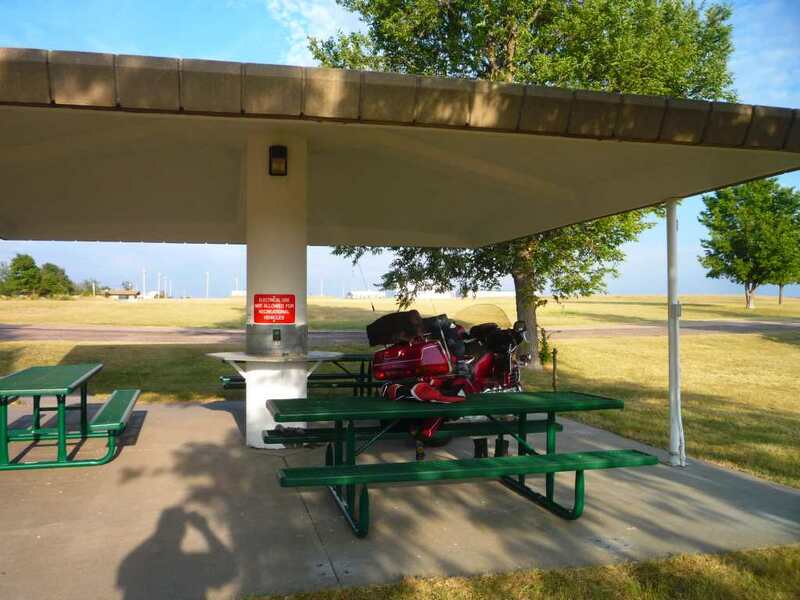 St Francis, KS is a small, quiet town, and offers a city campground. It has electric, water, rest rooms, showers, and it is FREE. The campground is well looked after and a pleasure to stay for no charge. Town has a few chain restaurants. I remember two local places to eat - but can't verify they are still there. In all, a nice, quiet, and FREE place to stay with water and electric. You wouldn't happen to have a link to the campground, or, a Google Maps link, pinpointing the campground, would ya? Hi. It is an absolute "can't miss it" place. The town is to the north of 36, the park is just to the south. If you scroll down to the bottom of this page, it is second from last. Roadside Park. Free Campgrounds. Nestled amid tress, this park is located just south of Highway 36 in St. Francis, and is a welcome retreat for the weary traveler. The campground feature hot showers, indoor restrooms, picnic tables, grills, covered shelters and disposal facilities. Your link is broken, but I think I found it on the map. I like to keep a bit of a 'Data Base' on free campgrounds. If you are going west out of St Francis there is no gas for 100 miles. Good place to fill her up. Part of my 'ritual' of making camp, is to always fill up just before, so I'll have a full tank of fuel when I pull out in the morning! Don's point is exactly how I found it in the first place - nice addition, Don. From the east, it is my favorite "last overnight stop" before hitting the mountains the next day. From the west, it is my "get to by the end of the day" place before riding midwestern roads all the way home. Often, 36 is a very useable two lane road. For what it is, it moves well. I80 to the north is a viable option if you choose to superslab it. I have stayed here several times and plan to again. I would rather ride 36 than the superslabs. It is a good highway from through Indiana until you reach the Colorado bourder there it is not well maintained. When I went through in August it was pot holed and lots of broken sections. Still rideable but kept you on your toes. Going across Illinois it is superslab part of the way and in Missouri it was limited access devided four lane but very little traffic. One other thing. Almost all the towns in Kansas had free overnight camping. Not KOA facilities but a place to get some sleep after a day of riding. Had a chance to stay at this free city run park. It is very well maintained/manicured, has flush toilets, hot showers, 15 amp electric, picnic tables and covered picnic areas, Frisbee Golf Course, no WiFi, or fire rings and I don't recall seeing any freestanding BBQ grills. The park/campground is set back far enough from Hwy 36, that traffic noise is not much of a concern. There is a Pizza Hut on the western edge of town that is the only restaurant that is open on a Sunday. As I approached this area of KS, from CO, I was greeted by what I thought at 1st to be a Tornado, as the sky was dark and ugly, but it turned out to just be a bad dust storm. Conditions when staying here were partly sunny skies, with high winds and temps once again over 100*. Very friendly locals like to come here to exercise their pets and to challenge the Frisbee golf course. Again I chose not to pitch a tent due to the temps and just laid my pad and roll on top of one of the sheltered picnic tables. 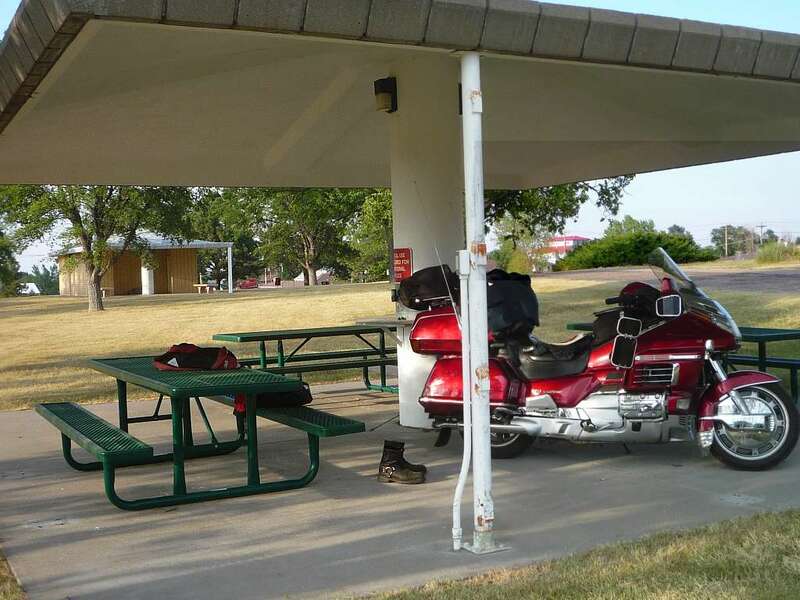 Nice quiet little park/campground, worthy of laying over for the night when travelling along Hwy 36. Can't beat the price of a FREE campground that has the facilities that this one has. In this shot, you can see the washroom/shower facilities in the background and electrical plug ins in the shelter to charge up cell/laptop etc. Nice quiet little spot!